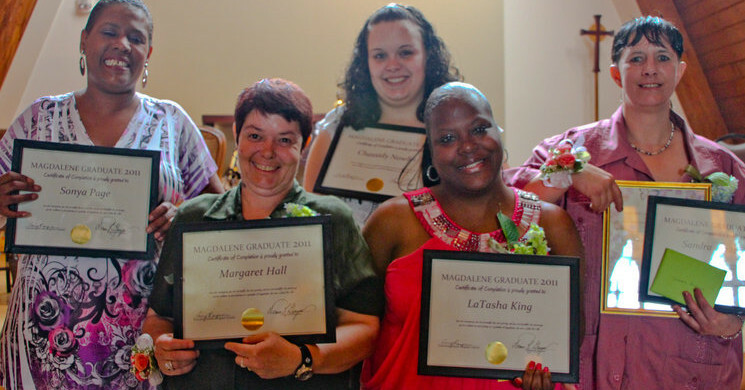 Our hearts are full at every Magdalene graduation. They are full of joy for all the graduates, full of prayers for women still suffering on the streets and in the jails, and full of thanksgiving for all those who helped bring this day into fruition. Our hearts our sated today with pride for the seven women who have completed the two year program. They are an unbelievable class of women. Graduation seems like it only take a moment, to walk down the aisle and shake a hand. But it comes from the same root word as gradual. Graduation is a slow process. It is a walk not a run, and there are no short cuts to the aisle. Graduation is the slow miracle of new life taking root and blossoming through seasons and hard work. When we are busy, doing what we are called to do, graduation comes before we know it. And then when its over, we head out back into the world to work in love to help others graduate. This is a beautiful day in the life of Magdalene and in the lives of all the graduates. Our hearts are truly full.